Two second-year undergraduate screen production courses at RMIT Media have introduced ‘digital dossiers’ as part of an attempt to foster a learning culture of ‘critical practice’. These digital dossiers, when embedded within a structure of process-based learning, may play an important role, we argue, in helping students identify and challenge assumptions they bring to their understanding of screen practice. How to encourage ‘critical practice’ in media students? This question is the key driving force in our approach to teaching two of the second-year courses in the RMIT Media Program1. All students who have chosen to specialise in film and television practice do so within these two courses, each of which runs for a 14 week semester (including 12 weeks of teaching) and constitutes only a quarter of that semester’s workload, involving only three contact hours a week. These time constraints necessitate a clear focus on the development of strategies and tools to maximise the learning opportunities for students. The courses are designed as an introduction to professional practices of film and television production, with the first semester course an introduction to making screen drama, whilst its partner in second semester is an introduction to documentary-making. In first semester the students individually write short (3-4 minute) drama scripts and then form into groups of 4 to each produce one of the scripts written by any student not within their group. In second semester student groups of 3 to 4 research and develop ideas for short documentaries, which they then produce. These two courses are part of the ‘Professional Strand’ of our degree. The explicit longitudinal structure of the program2 informs the students that in Second year they are specialising in either Radio or ‘TV’ and learning about ‘professional practise’ within that industry. We teach them how to use the tools of the professional screen industry – high-end video cameras, sound mixers and field microphones, industry-standard editing software. We teach them the conventional modes of collaborative practise within screen production: the standardised divisions of labour between directors, producers, cinematographers, etc, and how these roles interact before, after and whilst shooting; ‘correct’ methods of script layout; standard pre-production documents such as call- sheets, shotlists and schedules; post-production procedures such as logging of their footage, transcriptions (for documentaries), first assemblies, rough cuts, fine cuts, etc. By the end of the year they have gained an excellent theoretical overview through their own practical experience, on a small but intense scale, of the basic templates of the modes of production conventionally employed in the making of screen drama and documentaries. However we believe that if this were all the students were gaining from the courses, then we would be failing in one of the prime functions of a university education, which is to develop capacities for critical thinking and, we would argue, ‘critical doing’. After all, as Jean Pierre Geuens tells us, ‘the methods used to make films are far from neutral’ (Geuens, 2000: 411). Therefore we are endeavouring to weave into the foundations of our pedagogy, our course design and delivery, an emphasis on developing skills in being able to critically reflect upon the dominant modes of production, to question the ideological assumptions underpinning them and to position one’s own practise in relation to them. In this way we seek to differentiate themselves from straight ‘film- school’ and vocational programs, in which, Geuens has argued, ‘the [dominant] mode of production is pretty much taken for granted’ (2000: 412). Critical practice attempts to find a third way, to borrow an unfortunate term popularised by Tony Blair, between, on the one hand, a technocratic induction into existing production practises, which equips students as foot-soldiers for industry but not as future leaders capable of initiating incremental or, hopefully, radical change within and beyond those industries; and on the other hand a purely critical pedagogy, whereby students learn the analytic and research skills and understand key theoretical debates but do not experience how these conceptual issues may productively collide with, be challenged or invigorated by material practice, by what Paul Carter (2004: xii) describes as ‘the inventiveness of matter’. Another way to conceptualise critical practise may be to say that it takes Sholle’s (qtd Maras, 2005: 98) idea of a critical pedagogy that is ‘about how knowledge is constructed in relations of power – how things got to the way they are and how they might be transformed’, and it situates this critical pedagogy within the context of an experiental learning theory such as that put forward by Kolb (1984: 38), who says: ‘Learning is the process whereby knowledge is created through the transformation of experience’. Firstly we introduced a Course Dossier (Reader) for each course. The ‘Paper Dossiers’, as we call them to distinguish them from their ‘digital’ cousins, were specifically designed to model the discussion of critical practise – they contain a mixture of articles designed to give an understanding of professional practise in particular craft areas, as well as in broader national and historical contexts, but also to highlight key questions within the dominant assumptions of that practise. The Dossiers also contain practical technical information such as standard on-set procedures for calling shots and an introduction to the use of Final Cut Pro. In any given area of production, our aim is to give students an introductory understanding to ‘this is how things are usually done – in writing scripts, in recording sound in the field’, but also to encourage them to see that each process of production is not natural nor universal nor ideologically neutral – that things could be done differently – and are and have been done differently by numerous practitioners working outside or against the established norms. We are very conscious that the dossiers, and indeed the courses overall, should not be pale imitations of what is found in Cinema Studies (this also applies to the Digital Dossiers – we are trying to avoid a kind of ‘Cinema Studies – Lite’ approach). We do take note of what students may have already been exposed to in Cinema Studies courses (although a major structural consideration we have to juggle is that not all of our students – more like a half to two thirds – in fact do Cinema Studies as a major) and make an effort not to repeat but to build upon that knowledge. To give just one example, in the script-writing section of the TV1 (drama-focused) course, we included three articles, designed to accompany the two lectures on scriptwriting which introduced the conventions of screen drama. Taken as a whole, the three articles are in lively debate with each other. Dianne Cook’s (2007) excellent guide to conventional script formatting and layout is juxtaposed with an extract from a book by Jean Pierre Geuens (2000) questioning the way conventions of script layout squeeze the possibilities of what connexions will arise between words on the page and what is produced on the screen, and illustrating this with a highly evocative excerpt from the script for Murnau’s Sunrise which reads more like a poem than a standard filmscript. We also included an article by Kathyrn Millard (2006) questioning an exclusive focus on the established maxims of classic scriptwriting, as codified by standard scriptwriting books from Syd Field onwards. The inclusion of the technical guides in the dossier is a deliberate strategy that works in two ways – firstly to have the very different types of writing – the strictly instrumental and the more discursive and polemical – rub up against each other, as it were, rather than reinforcing a binary separation between the worlds of the ‘technical’ and the ‘theoretical’. Secondly, by having such necessary and highly useful technical information published in the dossier, we free up the teaching time in tutorials for more discussion and experimentation, as the students can use more of their own time to master the basic technical craft skills required. Another step in the development of a pedagogy of critical practice has been the placement of an increased emphasis on iteration – on processes of drafting and redrafting in the production of creative work, and presentation of works in progress. This is reflected both in the way the courses unfold across the semester but also via the design of assessment tasks. So for instance in 2007 documentary rough cuts were screened to class-mates and tutors in Week 11 of semester, more advanced rough cuts in Week 12 and fine cuts in Week 134, with the fine cuts being formally peer assessed for a value of 20% of the overall mark for the course. A comparatively small further 25% was held back for the final assessment undertaken by staff when finished projects are submitted two weeks after the end of the teaching semester. An integral part of this process of redrafting is the development of skills within the student cohort at the giving and receiving of constructive feedback – these are skills we explicitly discuss and provide frameworks for at the beginning of each course. We also work hard to achieve a dialogic relationship between the various elements of the course – the lectures, tutorial discussions, readings, workshop activities and exercises, project assignments and, importantly, the reflective practise that is emphasised across our Media Program curriculum, with the use of student and staff blogs. Concepts, theories and questions posed in the lectures are linked to the readings and followed up with debates in the classroom, which in turn feed back into the lectures – there is of course nothing new or radical about this; it is after all a standard method of teaching in the humanities. However the more difficult additional element is to mesh all of the above with what the students actually do in practical production terms, so that they see, and then reflect upon, how the theoretical ideas and debates actually may and do inform their practice. Then they can start to get excited about the ideas rather than seeing them as an irrelevant distraction. The first versions of the digital dossiers we created in 2007 were produced on DVD5 and distributed to students for a nominal fee ($1). We made one for each second-year film and television course: nick-named respectively the ‘dramadoss’ and the ‘docodoss’. The content of the digital dossiers range from clips from exemplary films by leading directors to innovative short films and even, at the other end of the spectrum, RMIT Media student works from previous years. Each digital dossier contained fifteen to twenty clips or short films chosen by the teaching staff, together with brief annotations that suggested particular creative elements that students should critically examine. Historically many of us teaching film production made compilation tapes on VHS for lecture and tutorial screenings. The VHS format allowed tapes to be authored relatively easily – there is a lot to be said for the efficiency of the dubbing process to VHS as opposed to authoring DVD. VHS is easily cued up. By comparison, cueing up DVD (in particular, before bookmarking was possible) is cumbersome and time consuming – an invitation to students to get restless and for the lecturer to lose momentum. Where VHS falls down is in its capacities for freeze frame and fast forward/rewinding. If left for any time in freeze frame mode the tape will either disengage from the heads or start ‘jittering’. To circumvent this we used to have to lay up the clip in repeats, place black in between each shot and/or play out the clip in slow motion. In addition to these ‘screenings’ in lectures and tutes we employed other techniques to encourage students to analyse films in detail. One of these we dubbed ‘digitise and analyse’. We encouraged students to digitise a scene from a film: either one they particularly liked or one similar to that which they planned to shoot. Using a non-linear editing program they could, in theory, analyse and deconstruct more easily – measuring the length of shots, analysing sound and vision overlaps and freezing frames to analyse lighting and mise en scene. However, in practice, for most students the process of capturing and deconstructing the scenes proved technically difficult and somewhat daunting, with the result that, give the time pressures they faced with their studies, too few of the students meaningfully engaged with this technique. The choice of clips6 compiled for the digital dossiers is subject to copyright considerations. The complexities of these issues have been negotiated with reference to expert advice from Anne Lennox, Coordinator of RMIT Copyright. The clips are gathered from a variety of sources; our existing VHS compilations were a good start. Much thought had already been put into their selection, and work into their compiling. However some of the clips were out-dated or of poor resolution, which is a sure fire ‘respect loser’ with University students. The RMIT library has an extensive collection of VHS and DVD ‘off air’ recordings of programs from broadcast television. Selections from these recordings are supplemented by clips from our own ‘off air’ libraries, recorded on VHS, DVD and PVR7 over the years. It is legal for us to copy and disseminate sections of these for educational use by RMIT students. Where we see fit, the aforementioned sources are supplemented with selected non-‘off air’ clips. To use these, we seek and obtain permission from their copyright holders, which may be the film- makers, production or distribution companies. This permission, we have found, is usually granted with little fuss when we make clear our educational intentions and that the work has been selected for its ‘how to-ness’ as opposed to its ‘how not to-ness’. Deconstruct and Analyse. An eclectic mix of films that is not meant to be a prescriptive body of work. It is not our top ten. It is more pointers towards good film-making. The aim is to spark connections and ideas and possibly at its strongest open you to consider new possibilities with your own projects. This philosophy is talked through and reinforced in lectures and tutes (Carlin & Ritchard 2007). COMMONWEALTH OF AUSTRALIA Copyright Regulations 1969 WARNING. This material has been copied and communicated to you by or behalf of RMIT University pursuant to Part VA of the Copyright Act 1968 (the Act). The Material in the communication may be subject to copyright under the Act. Any further copying or communication of this material by you may be the subject of copyright or performers’ protection under the Act (qtd Carlin & Ritchard, 2007). On the clip page a descriptor and a button to play the clip. When the clip finishes it goes back to the main menu. Each clip is categorised and described by its technical, structural and stylistic issues. With no extra time or resources available to devote to the project of producing the digital dossiers, they were made following the same emphasis on drafting that we advocate to the students, very much in the spirit of a pedagogical experiment – these were our imperfect first draft versions, which we wanted to put in play as part of the overall learning environment for the two courses to see what we could learn about how they might work and how students might find them useful. The idea was always that, as with the courses, the digital dossiers would evolve and improve each year. Although the students have access to a huge array of films and videos through the RMIT Library as well as online, not only via Youtube and other video-sharing sites but also via excellent curated sites such as the National Film and Sound Archive’s, the anecdotal evidence is that the majority of our students have only a very limited exposure to the breadth of film and television practice beyond the the mainstream of contemporary popular culture. In other words, their screen literacy is often at a relatively low level. Just because there is a lot of stuff out there, it doesn’t mean that the students are going to go and find it. Therefore one of our fundamental aims with the documentary dossier, and similarly with the drama dossier, was to crack upon their assumptions, providing thrilling glimpses of new aesthetic and conceptual horizons; to say, look at how Resnais (1993) has radically opposed sound and image in this particular scene, rather than having the two elements work in concert as you might have assumed they always should, or look at how Brian Hill (1998) has got his documentary subjects singing their stories of alcoholic dependence as if they were in a music clip rather than sitting in a chair under a light like a ‘proper’ documentary subject should. We hoped that by providing a series of short clips or short films, we were much more likely to be able to tempt the students to experience a taste of widely different aesthetic and political approaches to film-making. The aim was that those who were interested in a particular style or approach in a given clip may follow up by taking the initiative to watch the complete film, given that all are available via the RMIT library as well as elsewhere. We would foreground specific clips or films on the digital dossier in the context of the theme of a particular lecture or tutorial discussion, such as ‘sound design’ or ‘visual style’ – aiming always to encourage a more critical view of screen practise, by developing the students’ screen literacy. However, students were also encouraged to explore the dossiers in a heuristic way, following their own preferred viewing practices. Some students told us they dipped in to watch certain clips that were relevant to that week’s classes. Others apparently sat down and watched every clip and film in a single sitting towards the beginning of the semester, and then revisited particular items later as relevant. Student engagement with and learning via the dossier was assessed as a component of the reflective blogs. Students were encouraged to take initiative in reflecting upon aspects of clips and films in the dossier, and in particular to make connections with decisions they were making in their own film-making practice, as it was unfolding across the semester. This has provided us with a useful way to gain feedback on how they are benefiting or otherwise from engaging with the digital dossiers. [T]he digi-doss … was the happy medium between telling (theory) and doing (practice) – showing. It was good to see the theory brought up in lectures shown onscreen. I liked the choice of different kinds of examples – from cartoons, short films, popular movies and obscure foreign films, it was good to see a wide spectrum of filmmaking to draw inspiration from. I loved the inclusion of previous years’ short films, it was almost…comforting – knowing that people have gotten through it alive, haha. No but seriously, it was a good indication of the kind of work we would be making and that was really exciting (Lee, R. 2007). Digidoss Inspiration. Meandering around the Digidoss I found a couple of great films that I want to draw inspiration from for our final documentary (Ash and Lily permitting). 1. Werner Herzog “Lessons of Darkness” 1996. I watched this in True Lies in first semester ‘06, so it’s been a little while but I still remember the impression of a beautiful (albeit horribly sad) documentary full of stunning aesthetic and poetry – so it’s obviously made an impact on me. Elements of the film I want to draw from: Use of music – not the music style itself but a similarly sombre instrumental score for some parts (hopefully written/performed by our subject Mike himself). Poetic voice-over – we want to acheive an ‘intimate conversation’ for our voice over as Christine put it, as opposed to the ‘expository’ mode or ‘voice-of-god’ narration. One of our main aims is not to make our documentary ‘preachy’, but very subjective. Long pauses between voice-over for contemplation – In “Lessons of Darkness” this highlighted the music and reflective, poetic tones. It would be fantastic to achieve this. 2. Santiago Alvarez “Now” 1966. Never seen this one before but it is very punchy and aesthetically eye-catching. The use of striking stills were excellent and something we are planning to use also. Elements of the film I want to draw from: Slow zooms in and out on specific images – This looks quite effective but I think we’ll have to watch that it doesn’t become cheesy. Pans revealing elements in images – This is almost like reading a comic, you are waiting for the next bit of information. As Mike is talking through his pain for instance, we could have a pan across his wall of images and writings to reveal him lying still on his bed staring at them. Yay! The Digidoss is useful, it’s hard to spring new ideas from your head without getting some sort of creative input (Smith 2007). [I]t’s all relative. anyway, watched the digidoss. and my favourite would have to be cunnamulla. god, not because of the cinematography, no way, but because of the fact that the characters are soo…..juicy, i suppose, is a way of describing them. they are so open, and don’t even realise how they appear on a doco. and i like that. they aren’t faking anything. it’s all real. it’s the one i enjoyed the most. jabe babe was freaky…..interesting way of doing the doco…..different. interesting. very unlike a traditional doco, but then, what is i suppose. so, yeah, i enjoyed cunnamulla, and chicken ranch, the one about the brothel in the ’80s. i like it when people talk really openly (not to my face though, cos that’s just rudeeeee)….sometimes it’s not so pretty to hear/see what the people have to say, but you know, it’s how people are inside- ugly (Ong 2007). I’ve just watched TV2 Digidoss (a bit late I know) and I liked it; there’s plenty of clips to watch and I like most of them. They all have different styles and approaches to their subject, which gave me ideas for the assignments. However they are all excerpts from much longer documentaries, isn’t there any short documentary that can be shown as a whole? And I am interested also to see works from previous students (Hananto 2007). Our best evidence thus far as to how well the digital dossiers are working to facilitate student learning is from the student reflective blogs, as exemplified above, and from discussions in classes. Overall the students’ comments have been very favourable. Many of them particularly liked when the dossier was explicitly linked in with the lecture content for a particular topic, and the most common suggestions for the future, apart from that its method of distribution needed to be very straightforward, was that they requested a little more in the way of ‘scaffolding’ – more detailed explanatory text, for example, to accompany each clip or film. It would certainly be worth conducting a formal student survey to gain stronger qualitative data and this is an area to be followed up in further research. In terms of our overall emphasis on encouraging critical practice, the students have certainly responded highly favourably to the curriculum design of the two courses overall, and we believe that, importantly, the quality of their project work has also improved markedly compared to the previous year, particularly in the documentary course. As alluded to above, there are a multitude of online video resources available now, with short films viewable on Channel 4, ABC and BBC websites; this is a rapidly developing field. There are also CDRom-based resources such as those that now come with the classic Bordwell and Thompson cinema studies textbook Film Art (Bordwell & Thompson 2008). However, these book/CDRom package are prohibitively expensive for students, costing upwards of $100. There have also been a number of experiments in developing online screen analysis tooled for teaching and learning in Cinema Studies rather than Screen Production contexts. One example is the evocatively-named ‘Deconstructor’, designed by Larry Engel at the Columbia Center for New Media Teaching and Learning and ‘created to enable film students to effectively manipulate, describe and analyze films’ (Sosulski et al., 2005: 8). The Deconstructor is designed to analyse clips from films, graphing datasets to analyse visual elements such as shot lengths, camera angles and shot sizes. Another example is the ‘Australian Film Online’ project led by Jeanette Hoorn and Barbara Creed at the University of Melbourne (Hoorn & Creed, 2004). The first iteration of this project provided students with online clips from the classic Australian film Jedda accompanied by problems, questions and contextual information. This project was designed to augment classroom learning as well as facilitate distance learning in cinema studies. As discussed above, our digital dossiers began in the form of DVDs. The DVD format has affordances as well as limitations. On the positive side, DVDs can be played both on televisions and computers and can be projected at fullscreen with little loss of quality. They are easy to pause and rewind so lend themselves to close viewing. They do not require internet access which makes them more accessible for students who do not have broadband at home. But on the other hand, DVDs are time-consuming to produce, there are technical issues to do with the integration and display of text and interactivity is limited, difficult and clunky. Above all, unlike an online version, they do not lend themselves to regular updating. Interestingly one student ‘ripped’ the DVD digital dossier and compressed it down to mpeg4 to watch it on her ipod on her long train journey to uni. This kind of usage and our desire to deliver it in its most flexible, usable form, in the most easily updatable way has led us to the dossier’s most recent incarnation – the ‘digidossblog’. We are now moving towards an online, password protected blog as the new incarnation of our digital dossiers. The blog format facilitates plastic ongoing development of the digital dossiers as well as opportunities for interactivity. We can add content to the blog anytime we want and change text with ease. We can ask students to set up digital dossier annotation categories on their own blogs; these can be monitored via an RSS feed on the digital dossier blog so that both staff and students can keep track of the responses different students make to various clips – in this way critical dialogue can be facilitated amongst the cohort and the students can learn from each others’ ideas. We are also keen to explore annotation tools that enable students to insert comments on particular clips and freeze frames. The affordances of a blog are obvious in this situation especially when compared to a DVD. However the blog format is also not without technical issues: we recognise that current versions of Quicktime video on the web do not hold up too well to playing at full screen. The Quicktime format is also somewhat clunky in fast forward and rewind modes although this is improving rapidly. We keep full quality Quicktime archives of all clips we use so that when better codecs, compression or players emerge we can easily update. Since our aim with the digital dossiers is to facilitate literacies in critical screen production practice, the move to the online blog-based form opens up exciting possibilities for active student engagement. We may integrate exercises and exams based on the digital dossier into our assessment regime in a more structured way: currently student engagement with the dossiers is assessed in a relatively loose way via their reflective blogs. Other possibilities we are investigating include audio commentary tracks by staff and guest curators, as well as by the students themselves. There is also the potential to show problematic scenes, so that students can see what doesn’t work and learn to analyse flaws, as well as gaining inspiration from positive examples. This is all about scaffolding and supporting the students in their critical and creative thinking and production. We are not claiming here that the digital dossiers are a radical new development in teaching screen production, nor that others may not be using similar or divergent techniques to encourage student learning in this field. In part they are a specific response to the structural architecture of our program. As discussed above, we do not have the luxury of a film school in which students may be engaged in this practice all day every day across entire years. Within the time constraints we face, we believe the digital dossiers can and are playing a crucial role in augmenting the curriculum and in helping the students to develop both professional screen production skills and a critical understanding of how they may choose to apply them now and in the future. 3 An ongoing project to document this pedagogy is at the ‘post industrial media’ wiki (Miles et al.). 4 With the introduction across RMIT University of 12-week semesters in 2008, this process has had to be adjusted, with the peer assessed screenings now being conducted at Rough Cut stage in Wk 12. 5 The capturing (digitising) of the clips is a simple process using Final Cut Pro and a DVD player or PVR patched through a Mini-DV deck (as an analogue to digital converter) via a Fire-wire port. Since there is no time-code on VHS, DVD or PVR, deck control is switched to ‘Non-controllable Device’ in the ‘Log and Capture’ window in FCP. Then the operator presses play on the VHS or DVD player or PVR, then ‘Capture Now’ in FCP. The clip is topped and tailed before being compressed to mpeg2 for import to and authoring in DVD Studio Pro. 6 It is useful to define ‘clips’ at this point. In filmmaking a film is broken down into scenes, then shots. Final Cut Pro (FCP) labels the smallest digitised items ‘clips’. A clip can be part of a shot, a shot or a whole reel – that which is between the ‘in’ and ‘out’ points. We have borrowed this usage of the word ‘clip’ because the part of a film that appears on the digital dossier varies – it may be a shot, a scene or an entire short film. 7 The PVR (Personal Video Recorder, a hard drive with a digital receiver) is a great piece of technology for this purpose. The PVR allows high quality recording through the digital broadcast format, as well as providing the flexibility to make and edit lengthy recordings. 8 The other option would be to invest in developing a high-end database backend that would give us ultimate control and allow us to utilise annotation tools such as Engel’s Deconstructor or the Ricoh movie editing tool (http://www.ricoh.co.jp/src/multimedia/MovieTool/) or reinvent the wheel and develop our own. Bordwell, D. & Thompson, K. 2008, Film art : an introduction, International edn, McGraw-Hill Higher Education, New York ; London. Carlin, D. & Ritchard, P. 2007, Docodoss, RMIT University, Melbourne. Carter, P. 2004, Material thinking : the theory and practice of creative research, Melbourne University Publishing, Carlton, Vic. 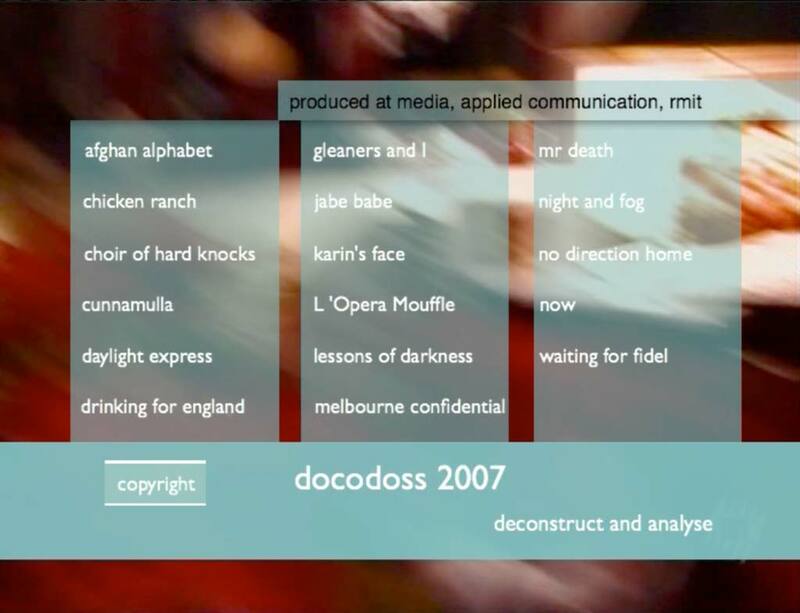 Cook, D. 2007, Script Formatting and Layout, RMIT University. Geuens, J.-P. 2000, Film Production theory, State University of New York Press, Albany. Hananto, A. 2007, Digidoss, viewed 24/6/08 . Hill, B. 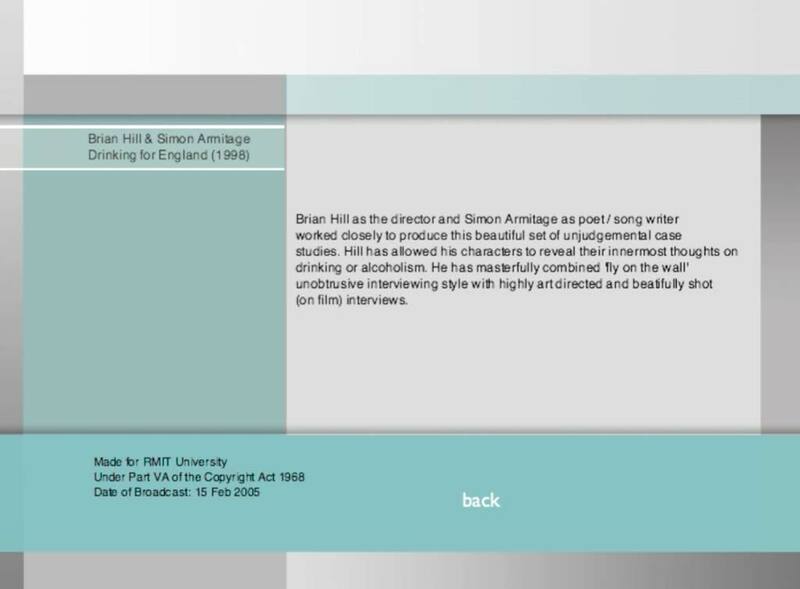 1998, Drinking for England, Century Films. Hoorn, J. & Creed, B. 2004, ‘An innovative film language tutorial launches Australian Film Online’, Uninews, vol. 13, no. 2, viewed 10/07/2008 . Kolb, D.A. 1984, Experiential Learning: Experience as the Source of Learning and Development, Prentice-Hall, Inc., Englewood Cliffs, N.J.
Lee, K.-Y. 2007a, Whole new world, viewed 24/06/2008 . Lee, R. 2007b, There’s a clamour in your whispering tonight, viewed 24/6/08 . Maras, S. 2005, ‘The problem of theory and practice: towards a constitutive analysis’, Journal of Media Practice, vol. 6, no. 2. Miles, A., Thomas, A., Carlin, D., Donnar, G., Ritchard, P., Wilson, R. & Keen, S., post industrial media, viewed 10/07/08 . Millard, K. 2006, ‘Writing for the Screen: Beyond the Gospel of Story’, SCAN journal of media arts culture, vol. 3, no. 2. Ong, E. 2007, i’m drowning in a sea of stupidness, viewed 24/6/08 . Resnais, A., Cayrol, J., Seyrig, D., Kérien, J.-P., Klein, N. & Hen’s Tooth Video. 1993, Muriel, ou, Le temps d’un retour, videorecording /, Hen’s Tooth Video,, Las Cruces, NM. Smith, A. 2007, Digidoss Inspiration, viewed 24/6/08 . Sosulski, K., Engel, L., Campbell, G. & David, L. 2005, ‘The Deconstructor: Providing the Scaffolds for Students to Excerpt, Describe, Analyze, Interpret and Synthesize to Form New Understandings’, viewed 30/6/2008 . David Carlin is a writer, director and Lecturer in Media at RMIT University. He won the RMIT Teaching Award for Outstanding Contribution to Teaching as an Early Career Academic in 2007, and is a member of the Media teaching team awarded an ALTC Citation in 2008. David has recently published in Overland and Senses of Cinema, and has a book of creative non-fiction to be published by Scribe in 2009. David’s PhD, a hybrid creative writing/dissertation thesis, investigated issues in the translation of traumatic memory into narrative. His research interests currently centre on intersections of memory studies with film documentary and drama practice, digital archiving, cross-platform production, autobiography and memoir. Paul Ritchard lectures in Film and TV production in the Media discipline at RMIT University. He is a filmmaker and musician who has previously made 13 short films. He has also worked in the screen graphics field on features including Matrix Reloaded and Matrix Revolutions. Currently he is involved in the ‘Motel project’, which is producing a triptych of films investigating parallel storytelling, parallel time in editing and new methods of collaborating.